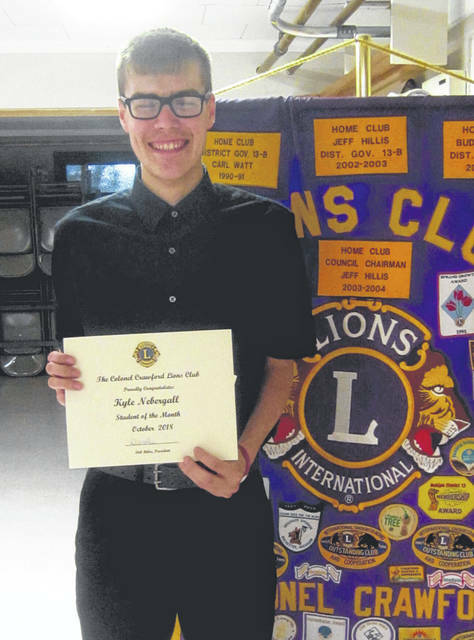 NORTH ROBINSON — Senior Kyle Nebergall is the October Colonel Crawford Student of the Month. He is the son of Nathan Nebergall and Barb Roberts. Kyle has earned an Academic Letter for each of his high school years and is a member of National Honor Society. He is also a member of the Academic Challenge Team. Kyle attended Boys State last summer. He is currently taking classes at North Central State College and Hocking College. He plans to attend Ohio State University to become a family physician. Nebergall is employed at McDonald’s as a People Department manager. In his spare time, he enjoys reading and fishing. Kyle, his mother, and grandfather Richard Eichhorn were guests of the Colonel Crawford Lions at their October meeting. He was presented with a certificate of recognition and a check for $50.